Just by looking at his resume, I could convince you that Andy Bronkema is a basketball coach that you want to play for. Sure, it’s impressive that his Ferris State Bulldogs just won the NCAA Division II National Championship. Obviously, Coach Bronkema being named the 2018 National Coach of the Year won’t hurt my cause, either. And yes, with a record of 123-41 through his first five seasons at FSU, it’s clear that Andy Bronkema is one of the best coaches in all of basketball. But, the real reason I want to convince you that “Coach Bronks” is a guy you want to play for is this: he’s just a cool dude. He gets it. It’s clear that his family is way more important to him than winning a National Championship ever will be. 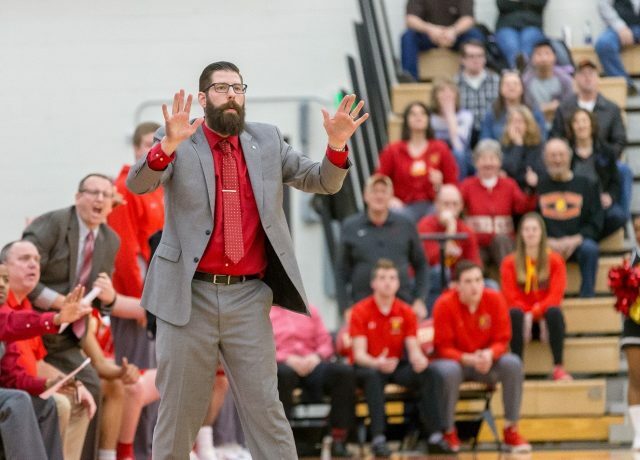 He’s appreciative for the opportunity Ferris State has given him to coach basketball. He loves playing whiffle ball, and he’s got a beard worthy of its own reality show! This week, I had the great privilege to talk college recruiting with Coach Bronkema. From his take on getting an email from a player, to how important body language can be in the recruiting process, here is what he had to say. Q: How can a recruit be sure he/she is making the right college decision? A: You can typically consider the same factors, when deciding on where you want to go to school, regardless of the division. Most recruits want to play, and they want to win. At least that’s what they say! So, whenever I talk recruiting, I tell kids to go where you can play and go where you can win. Find a school where you have an opportunity to make an impact early on or where you can play right away. And, go somewhere you can win, because losing isn’t a whole lot of fun. I think it’s safe to say that most recruits wouldn’t be happy sitting on the bench, not contributing, especially for a team that doesn’t win much. Athletically speaking, you could sum recruiting up with those two ideas, alone. Q: Is sending you an email a good way for a recruit to get your attention? A: We need to see you live, plain and simple. Whether that’s seeing you in a game or at a camp, we’ve got to see you with our own eyes. Yes, if we watch a highlight video that we like, it’s obviously going to get our attention. But unless you’ve got 6’10” listed in your subject line, emailing us is a terrible way to get our attention. We just don’t check our emails looking for recruits. That’s not how we identify players. We get out and we watch basketball. The great majority of the time, we’re out there finding the talent; the talent isn’t finding us. Q: Physical talent aside, what are you looking for in a recruit? A: Body language. Mannerisms. Those are non-negotiables for our program. The way a young man carries himself on the court is what separates who we make offers to, and who we don’t. Obviously, your physical talent can get you attention from any coach or any program. But, it’s the body language that will determine the details. When you foul out, are you ripping your jersey out of your shorts and making a scene? Or how about when you’re subbed out. Are you able to be coached in moments of stress? Do you still care about your team, or is it all about you? How do you look at the flag when the National Anthem is played? Every detail matters in the evaluation process and how you handle yourself on the court, regardless of the situation, will determine what school you end up playing for. Q: What is your take on recruiting multi-sport athletes? A: We have a multi-sport athlete in our program right now, who also plays football. I love it and I love recruiting the guys that are multi-sport athletes in high school. Here’s the deal about multi-sport athletes: they’re not boring! We play whiffle ball with our guys every year and you’d be amazed, half of them can’t even hit the ball! What are you going to do at the family reunion when you can’t hit the ball? I mean come on, let’s be more than just good basketball players, here! All jokes aside, each sport has something else to offer. Winning looks different in every sport. And, you have to figure out different ways to get it done. Figure out how to win and how to compete. When you can recruit guys that know how to win, across the board, there’s a good chance that winning will translate into our program. I know everyone feels differently about specializing in a sport, but for me, I’ll take the guys playing all the different sports, every day.